No one gets healthy accidentally! Everyone makes choices. Everyday, you interact with people, places and things including yourself. It is those choices you make in those interactions which dictate your state of health. Do your choices lead to health, vitality, energy and a passion for life or do those choices force you to settle for less? Do you want to settle for less? You don’t have to, nor should you. I’m going to let you in on a few secrets. Secrets related to creating health. True health is a birth rite. It is a rite everyone of us, including yourself was born with. Unfortunately, many of us have given it away, subconsciously, unknowingly thrown it away. I don’t what to discuss the why or how. That’s another topic. What I want to offer is insight into how you can get it back and never again let it go. True health takes place at the cellular level. I say this because this is the lowest level within the biological levels of organization that we have any degree of control over. Yes, it’s time for a bit of biology and chemistry, just a little. I promise. It’s important. At a base level, we consist of atoms (elements or chemicals), material on the periodic table, carbon, hydrogen, oxygen, etc. The next level up are combinations of atoms bound together forming molecules. Examples include water (hydrogen and oxygen) or glucose (carbon, hydrogen and oxygen), even cholesterol and testosterone, all molecules. If you combine molecules you create macromolecules. Macromolecules include triglycerides (3 fatty acid molecules bound to a glycerol molecule). Multiple amino acid molecules combined create protein. When we combine macromolecules we can have a cell. A cell is the first structure in the level of organization containing all the components needed to create, sustain and reproduce life. If you take a bunch of cells you can create tissue of which there are only four kinds (Epithelial, Connective, Muscle and Neural). Combine the appropriate tissues and you create a gland or organ. Take a number of glands and organs which have similar functions and you create one of many complex systems such as the cardiovascular and digestive systems. If you have the right combination of systems working together you have a fully functional organism such as yourself. It’s incredibly amazing really, when you understand what is involved to create a living, breathing human being. The biology and chemistry involved in the inner workings of a cell are mind boggling to say the least. We are so complex yet at the same time we are governed by some pretty basic and simple rules. Unfortunately, these rules have generally been ignored, misunderstood, even thought as too simple to have any true health impact. If you recall, I said earlier that health happens at the cellular level. Every cell, every one of the 100 trillion + cells in your body contain a program. A program of instructions which direct and ensure the viability and function of that cell. This program is literally built into the DNA. This program, at a cellular level, is designed to manifest true health, optimal function, 100% efficiency. This level of function is in fact our normal state of function. A health challenge, regardless of how common it may be is not normal. If you have a bunch of cells, functioning normally, then the tissue that those cells make up will function normally. The glands and organs that efficient tissue makes up will also perform normally. The complex systems made up of those normal glands and organs will perform their function normally. If all the systems of the body are working as they were designed then the entire organism will function normally manifesting health. Anything less than health, vibrancy, energy and function is a sign that cellar dysfunction or deficiency exists. The only question then is what is driving this level of dysfunction, or as I call it, Metabolic Chaos™? The signs/symptoms, challenges, disease or diagnosis are not the problem. They are the outward manifestation of the true problem, that being Metabolic Chaos™ or cellular dysfunction. The allopathic or medical model excels at managing symptoms (relief care) by suppressing unwanted function. This is done largely through prescription drugs. Less used but just as impractical is chemotherapy or radiation treatments. When these methods of managing symptoms fail, there exists the most extreme form of relief care; surgery or the removal of the offending tissue, gland or organ. Unfortunately, you can’t heal that which no longer exists and you have to deal with the repercussions of that lost level of function. While signs and symptoms offer insight, they are merely the messenger, the teacher attempting to communicate with the host that imbalances exist at the cellular level. 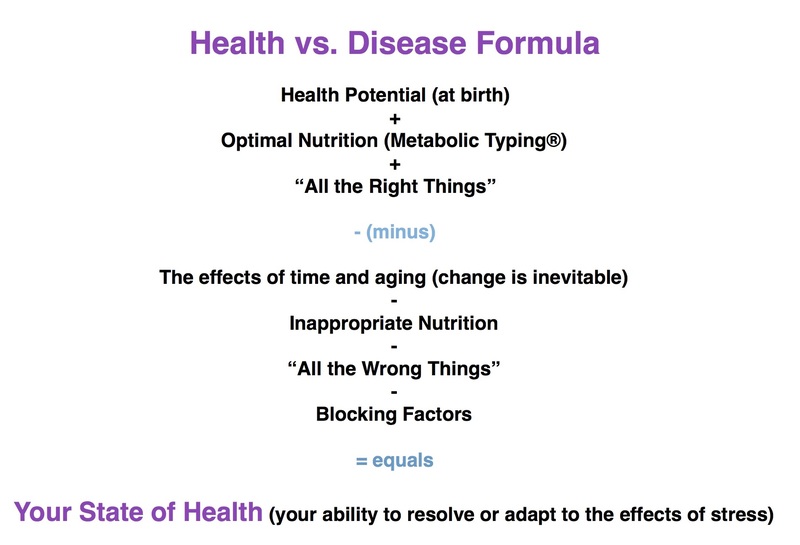 If you supply your cells with everything they need to function, and eliminate or reduce everything that interferes with that level of function, and allow some time, your cells will more effectively execute their health program. There is nothing more required; no self help books, no how-to videos or DIY guides. Your cells already know. They are merely waiting for the opportunity to prove themselves. Think of it another way. Your cells are doing the best they can considering the circumstances they have been placed in. Or, your current state of health is the result of all the experiences, choices and decisions you have made throughout your life up to this moment in time. Does that make sense, does it ring true if you really listen to your body’s innate wisdom? Or does this sound too easy? It has to be more complex than that, doesn’t it? Earlier, I mentioned choices, that is, how you interact with people, places and things including yourself. This is the key to success, when you have the right perspective. 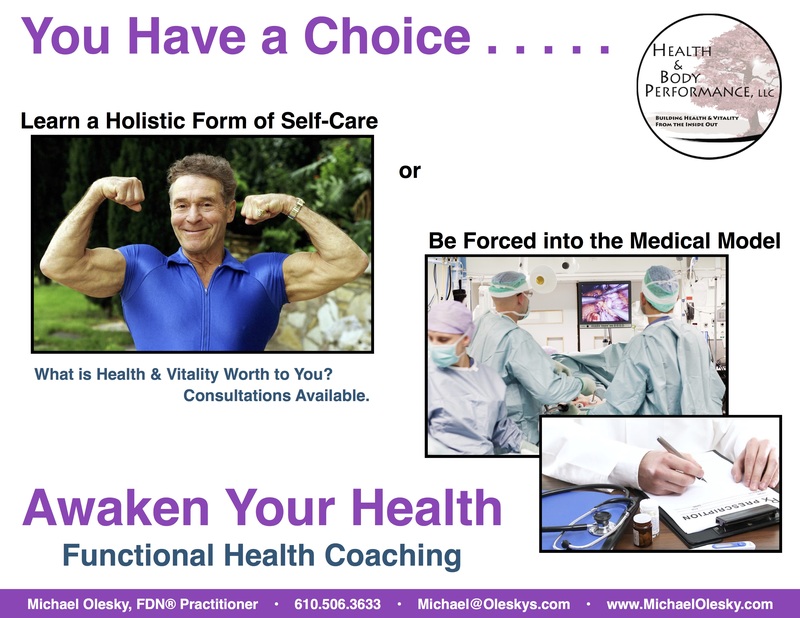 Are your life choices manifesting true health, or are they manifesting poor health? Are your choices based upon your core values and what your innate wisdom needs and is asking for? Or, are you living according to the dictates of modern society in spite of what your inner voice is communicating? Lets get back to those important cells. The root cause of cellular dysfunction, manifesting as unwanted health challenges, is typically the results of two major stressors; malnutrition and toxins (heavy metals, environmental pollutants, chemicals etc.). Malnutrition: Every cell requires specific and varied nutrients, essentially molecules and macromolecules to drive metabolism. These nutrients are derived from the food you eat on a daily basis. As Bill Wolcott, the creator of Metabolic Typing® has so clearly pointed out, if you supply your cells with their unique genetically determined nutritional requirements then you will experience the results of healthy functional cells. There is nothing you can do that will compensate for, or is more important than, feeding your cells what they need. The only question then is what genetically determined nutritional requirements do your cells require? Toxins: Toxins are fun in that toxins have a few nefarious abilities. First, toxins have the ability to displace nutrition. They can interfere with getting nutrients from your food to the interior of your cells. They can negatively impact this process at many levels including digestion, absorption, transportation, assimilation and finally oxidation or intracellular utilization. Additionally, toxins can be carcinogenic, endocrine disrupting and mutagenic in nature. These qualities are very disruptive further amplifying Metabolic Chaos™. Considering how toxic the environment is, literally and figuratively, eliminating toxin exposure is virtually impossible. Reducing exposure is within your grasp and so is strengthening your body’s natural defensive mechanism, the three detoxification pathways. At this stage you should see how health is built from the ground up, the inside out. This is in opposition to everything we have been taught, told and led to believe. 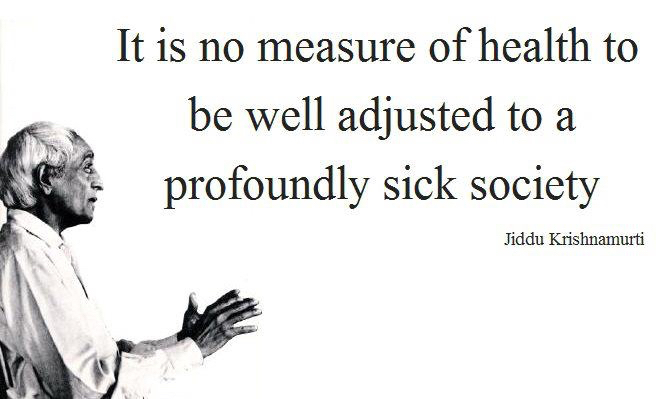 This wrong perspective would explain why poor health and chronic diseases are at epidemic levels and getting worse. We are looking at the problem with the wrong set of eyes. If one wants to attain health, vitality, energy and embrace life, the focus has to be on supporting cellular function. That being said, if you find yourself in a life or death situation, you have to use everything at your disposal including modern science and medical advances to remain alive. After all, if your dead everything else is irrelevant. How then do you know what any given individual needs and doesn’t need? There are many variables. Everyone is as unique in there own biochemical metabolic processes as they are in their fingerprints. While we all have the same parts how efficient or inefficient they work alone and together can vary wildly. Everyone has lived a life making choices individual to them and we each have our own unique genetic predispositions. While it is true, there never was and never will be another human being just like you, there are many effective tools at your disposal. While you can repair some problems with a hammer, you can’t fix every problem with a hammer regardless of how hard you hit it. To facilitate this process of understanding I use specific functional lab tests. Functional labs and the interpretation of those labs relative to you, the individual presenting those results and symptoms is where I gain insight into the state of function at the tissue, gland, organ, system and even cellular levels. Everything I do within my Awaken Your Health programs is designed and clinically proven to support the body positively impacting cellular function. Improve cellular function, allow for time and the body can heal itself. While a significant portion of the population can heal themselves of most common symptoms and complaints, even of a full blown diagnosis, some people are too damaged at the cellular level to make a full recovery. Even then, we can still improve function and see an enhancement in overall quality of life. My clients get the results they do by altering not only the environment they live in, but more importantly, how they interact with people, places and things including themselves within the framework of the D.R.E.S.S. for Health Success® Lifestyle Grounding Program. Think about it this way. If you do nothing different in how you interact with life, is it realistic to expect the outcome to be any different than it currently is, or that the direction you are heading should deviate from its present course? Of course not. If you’re not assessing you’re guessing, and I don’t guess! There are specific reasons for, and realistic outcomes expected from the protocols I recommend. I turn over every rock, digging below the surface as deep as required, taking advantage of every healing opportunity that presents itself. All I ask of my clients is to be as enthused, motivated and committed to rebuilding their health as I am. I’ll bend over backwards to help you reach your goals. Realistically, you have to do the work. You have to change how you interact with people, places and things including yourself. I can’t do it for you. The proof is in the results. I have healed myself and have helped many others do the same. Give me six months and you can change your future. Next postIs Play Missing from Your Health Quest?